The PhilPapers Survey never asked me for my philosophical views, but that’s not stopping me. So here is my stab at the survey, one post at a time. I accept the objectivity of aesthetic values. This is an important question for me. It is the question which by which I first realized my interests in philosophy. When I was a senior in high school I went with a couple of friends to see the movie American Beauty. After the film, I made the comment that I didn’t think that a plastic bag floating in the breeze was particularly all that beautiful. My friends both agreed that beauty is in the eye of the beholder and that if the boy in the film thought that it was beautiful, then he was entitled to that opinion. For some reason I vehemently disagreed and for the next four hours or so we debated the objectivity of aesthetic values. Of course I didn’t know we were debating such a heady metaphysical topic at the time. I just kept insisting that certain things were simply more beautiful than other things, no matter what the opinions of people happened to be. If everyone were to agree that Jimmy Buffett’s Margaritaville is more beautiful than Beethoven’s Ninth Symphony, I would say that they were wrong. I think there is an objective reality that grounds the judgment that the Ninth Symphony is the more beautiful work and those who disagree are insensitive to the reality of that objective beauty. Beauty is one of the great transcendentals along with truth and goodness. Though they are transcendentals, I think they are as much objects of our senses as there are objects of sight, sound, smell, sound, touch, and taste. Admittedly there is a subjective component to these sensation, but the question is whether the “value” of these components is the subjective part. I don’t think so. If there is a red apple in front of me, it is objectively red. We might say that it ought to be evaluated as red, because its color-value is red. If I say that I see the apple as green, then my subjective experience of the objective reality is wrong. Likewise, if I see a hungry homeless man begging for food and do not sense that I ought to bring him something to eat, my subjective experience is off-kilter from the moral-value which ought to be impinging upon my moral sense. So also, if someone were to see Botticelli’s Primavera and not judge the work to beautiful, such a person must have a dysfunctional sense of beauty. 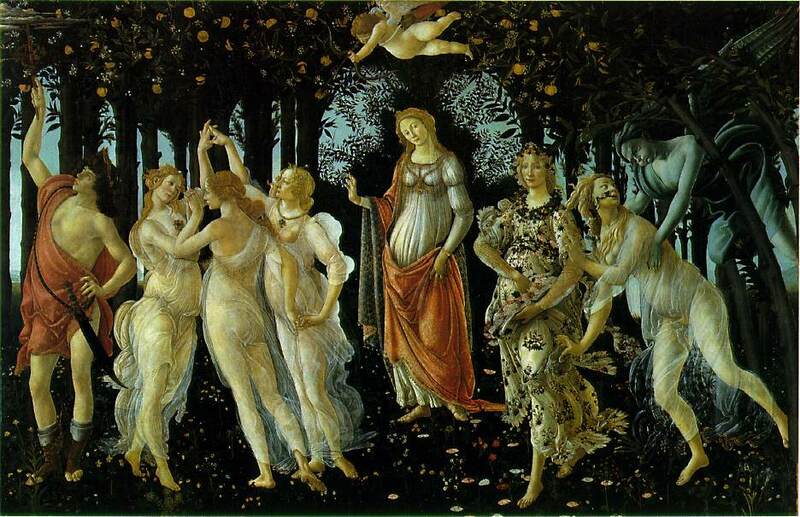 Now, it might be true that a person does not particularly like Botticelli’s Primavera. A person can freely admit that they enjoy Brittney Spear’s Hit Me Baby One More Time to O God Beyond All Praising. I don’t think aesthetic value has to do with whether one derives pleasure from an object. I could say that Botticelli’s Primavera is objectively more beautiful than Jackson Pollock’s Autumn Rhythm, but that I enjoy Pollock’s painting more. What I am admitting is that my feelings do not always accord with that which my senses ought to sense. So I want to distinguish between matters of taste and matters of aesthetic values. To compare back with the other two transcendentals, I might also prefer some moral evils to some moral goods, or falsities over truths. But my preferences do not change objective values. 1. Truth, goodness, and beauty are eternally and essentially attributed to God. 2. God is simple, i.e. without component essential attributes. 3. Truth, goodness, and beauty must not be essential parts, but different ways of describing essentially the same attribute of God. 4. If something is an objective reality, it differs in its fundamental reality from something that is a subjective reality. 5. If beauty is essentially the same as truth and goodness, it cannot differ in its fundamental reality from them. 6. Truth and goodness are objective realities. 7. Therefore, beauty is an objective reality. I think this argument would need to be developed and defended further, but I think this is sufficient to ground my belief in the objectivity of aesthetic values. How would you respond to this question?